We live here. We work here. We are moms. We are realtors®. Learn more about us. "Erin and everyone at the Burlington Neighbourhoods team goes above and beyond a Realtor's duties." "Her market knowledge, professionalism, patience and flexibility made an overwhelming experience so easy." "We met her on a 2 day trip out to Burlington and instantly knew we could trust her. She even talked us out of buying a home that she knew wouldn't be the best for us." "Having originally considered selling privately, we were definitely happy we chose to work with Julie instead, and we would wholeheartedly recommend her to anyone!" "Erin is a pleasure to work with in every capacity, she is well informed, professional, friendly and supportive." Creator of BurlingtonNeighbourhoods.com, Bradbury Estate Realty Sales Representative, Licensed in 2006. Awards: RE/MAX Hall of Fame 2015 & "3 Best Rated" (Burlington Real Estate Agents 2018). Lives in: Aldershot. Why did you create BurlingtonNeighbourhoods.com? Eight years ago someone asked me, “What are the best neighbourhoods in Hamilton? I didn’t know that city at all and decided to google “What are the best neighbourhoods in Hamilton?” This search brought me to a forum where a real estate agent answered the question. I thought… that’s brilliant. I want to be the agent answering that question about Burlington! People who are moving to Burlington have a lot of questions and concerns. It has always just felt like my duty as a Realtor® to anticipate and answer these questions. I become an Ambassador to the city through the website and then a personal tour guide when I meet clients in person. I love it. What do you love most about Burlington? I love that Burlington borders Lake Ontario and that The City made developing a waterfront where people can gather and enjoy themselves a priority. What do you love most about your neighbourhood? Aldershot is a special and somewhat overlooked neighbourhood in Burlington. It’s easily one of most beautiful areas, with rolling hilly streets, lakeside properties and wide tree lined streets. I just love walking here, especially the walks with my daughter home from school. What is your favourite restaurant in Burlington? I have to say Paradiso. Love its charming location in the “Village Square” downtown, and the food never disappoints. I love figuring out how to connect with people. Everyone is different and listening is so important. Once a great relationship is established, buying or selling a home together is just fun. 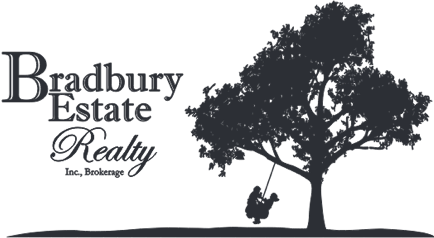 Why did you join Bradbury Estate Realty? I heard about the “Giveback Program”. It meshed with what I love most about the business, really listening to clients and responding to their needs, often before they even know what those needs are. What clients do you work with most often? Most of my clients are young families, people who need more space or are relocating to Burlington. That said, I have also worked with many downsizers who want to get closer to grandchildren, single people making a life change, and professional couples purchasing their first homes. No one will invest more wholly in the sale of your home. We will become your trusted partner, and not simply your realtor®. We will even go so far as to put our own money up front to ensure your home is capable of selling for more than the competition. See our Selling page more details on all of this. Sales Representative with Bradbury Estate Realty, Social Media Strategist, Mom of 3, Local Restaurant Critic (Self-Designated). Lives in: Central. Why did you decide on a career in real estate? Initially, in a word: MLS. While shopping for our family home, I became mildly obsessed with the browsing. There’s something about seeing that first photo of the exterior of a home and then getting to take a virtual walk through the inside. That might sound creepy, but I think there are more of us who glance into brightly lit homes when it’s just getting dark outside. Why did you join Bradbury? I decided to join Bradbury even before I was licensed, because of the sheer genius of the GIVEBACK program. If you can partner up with your homeowner, make the transition a smooth one, sell beautiful homes as a rule, and create stories to be told over and over again, why wouldn’t you? The value offered to each and every client is how this brokerage sets themselves apart from the rest. I love that each day is completely different from the last. I love getting to educate and help people at important points in their lives. I love connecting with people and creating a relationship that lasts beyond the transaction. Burlington, to me is a microcosm of Canada. Everyone is friendly, willing to lend a helping hand or an ear. It feels safe, somewhat diverse, quaint, though not without modern conveniences. Add to that the lake, the escarpment, the forest and farmland and it’s basically a mini-Canada. My favourite things about my neighbourhood (Central) are my neighbours (an ideal mix of young families and older people and everything in between), the walkability and the trees. We also have a pretty amazing library, as well as a good portion of the bike path. What’s your favourite restaurant in Burlington? When you love food as much as I do, you cannot answer this question with one option. After a great amount of thought, I’ve decided that Spencer’s At The Waterfront has THE BEST Sunday brunch in the city, D Hot Shoppe is the best weekday lunch option, The Carriage House has the best nighttime ambiance and On A Bun has equally friendly service and delicious Italian sandwiches. Clients I love to work with? I love working with clients who need help. From busy moms who don’t know where to begin to first time buyers who need help understanding the process. And why you should hire me to sell your house? You should hire me to sell your house because I will take it on as if it were my own home. I’ve been known to paint cabinets late into the night, pack up a house full of items for donation/moving, pull weeds in the extreme heat, pull up carpet, peel wallpaper and scrub floors. Then show up with fresh flowers and homemade baked goods for the open house. I see your home as a reflection of myself, and take every challenge on like it was my own. Community Event Coordinator, Mom of 2, Winner of Burlington's 2017 Community Service Award (for Burlington ROCKS!) Lives in: The Orchard. I want to help individuals and families during what can often be an exciting and sometimes stressful time in their lives. I’m most interested in forming true connections with others. Bradbury Estate Realty is a unique brokerage that celebrates family in all its forms. The atmosphere of teamwork and true support for each other is unparalleled in the marketplace. I love knowing that I can help someone gather all the information needed and feel confident in the buying and selling process. Having lived in several cities across the GTA, Burlington is hands down the most community minded and kind group of people I have ever encountered. The natural features of Lake Ontario and especially the Escarpment also mean you’ll never run out of places to explore. The Orchard is an incredibly vibrant community filled with families and couples who love living here. Neighbours quickly become good friends and our family loves the amazing parks, playgrounds and forest trails. I love LA Cupcake Boutique. Beautiful and delicious cupcakes all handmade by the owner and her team. I love staging! As a former HGTV stylist with credits on “One House, Two Looks” and “One Garden, Two Looks”, I’m great at staging a room, garden or a whole house under a tight time constraint – a good skill to have when you’re supporting a busy real estate team! I’m also a ‘people person’ and my passion is making a home look its very best. I love seeing how my clients’ faces light up when they see their newly decorated home. They often can’t believe it’s the same place! Bradbury Estate Realty has allowed me to live my dream job while helping their clients live the dream.